A Most Ingenious Paradox: Arianna Huffington Saves the Day! I friggin love the Huffington Post. My dream is to write for the Post one day, if Lady Arianna deems me worthy of a job. I will use posts from The Paradox too woo and wow her with my wit and charm and she will be so blown away that she will just have to employ me. Why do I love HuffPost so much? Well I was thinking that all of today's political headlines were boring (NY Rep Kirsten Gillibrand appointed to Clinton's U.S. Senate seat! Obama got annoyed when a reporter asked him a question at a social meet-n-greet! G-Rod makes another stupid speech! Yawn...) and then I visited the flashy Huffington Post and discovered that Ty Dolls (of Beanie Baby fame) has produced "Sasha" and "Malia" dolls and is claiming that they're somehow not supposed to be little doll depictions of SASHA and MALIA Obama... derrr... here's a picture. 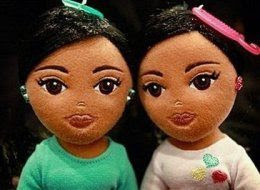 They're little girl dolls, sold as a pair, they are cute and most likely African American (although you could argue for Indian or some other type of Southwest Asian I suppose) and they're named SASHA and MALIA! Who dropped the ball on this one? Michelle Obama, classy lady that she is, called the whole thing "inappropriate" and went about her business, but you better believe those dolls will be off the shelves quicker than you can say "just compensation." The company insists there's no connection to the Obama daughters. They just chose what they thought were "beautiful names." "There's nothing on the dolls that refers to the Obama girls," spokeswoman Tania Lundeen said. "It would not be fair to say they are exact replications of these girls. They are not." Reminds me of when Budweiser had its "BudPong" promotion,, which it claimed was a fun game all about drinking water, like they didn't know people play beer pong with... beer. Similar situation.